This page contains some of the questions we have been asked about food and drink. We will add more to it as we find out more from the venue in answer to your questions. This year's venue is a new venue for Autscape. Is there somewhere I can make a hot drink? All bedrooms have a kettle, one cup per occupant and tea and coffee sachets. There is also a place near the conference rooms which will have hot water for drinks periodically throughout the day. Is there somewhere cool I can store alcohol? The venue does not allow the consumption of alcohol anywhere on site. The nearest pub is about half an hour's walk from the venue. There is also a pub by the Sunley Centre (where some people who are attending non residential are staying). Autscape will be running a non-alcoholic or soft drinks bar. Can I heat my own snacks? The microwave is only for reheating baby food outside of main meal times. 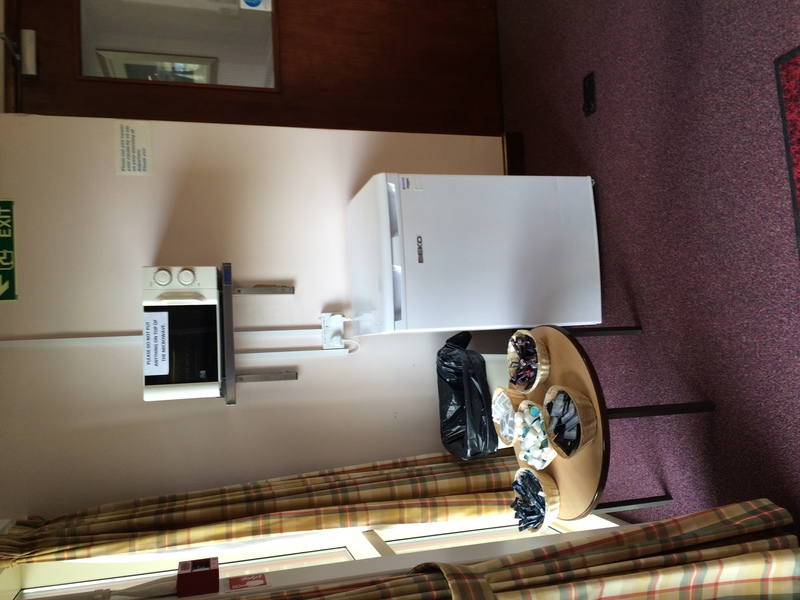 The venue do not allow food to be reheated on site. Where can I eat my own food? The venue do not want us eating meals in the bedrooms. They accept that some Autscape participants may need to do this and have asked that we don't place people who will be bringing meals to their bedrooms in any of the newly decorated bedrooms. If you may be bringing your meals to your bedroom you must let us know in advance (before the end of booking) so we can ensure your bedroom is correctly placed for this. We expect to have a quiet dining room this year. Is there a fridge I can store my own food in? No. This venue is not like the venues we have used in the last few years. In this regard it is more like Ammerdown which we were last at in 2010. There are no kitchen areas for participant use. There is one small fridge between everyone. If you usually bring your own food because you are worried the catering isn't adequate for you then you need to contact us in advance so we can pass your diet needs to the venue. The fridge will be used by people whose diet needs are not fully catered for. For example if the venue provide soya milk for the vegans and dairy free people and you only like sweetended soya milk or rice milk then please bring your own container and ensure you label it. The same kind of thing could happen with butter alternatives. We will provide labels. If you will need to store medication in the fridge we would find it useful to know if it needs a lot of space. Yes, subject to demand we expect a choice between meat and vegetarian dishes at each meal. We have received a number of requests from people who would like meat, but not at all meals. The venue are happy to cater for this. It is useful for us to know in advance so they can plan how many vegatarian dishes to prepare. Will the food be served buffet style like at Giggleswick? No. This venue has a different system in order to cut down on food waste. They will tell us which meals they will be serving and you select the meal you want in advance usually after the previous meal. A few extra of each meal option are cooked in case people change their minds or choose something unsuitable. Here is more information about the meal system. We will try to have the meal selection available just before Autscape. Can I purchase items I forget at the centre? The site has a very small shop and here you can buy essentials you forget. You pay for them at the site's reception desk. The shop also sells gifts and chocolate bars. Painkillers are not sold in the shop, they are only available from the site's reception desk. Autscape will run a shop to compliment what the site are selling. If you have not yet given in your dietary needs please send them to autscape2017needs@autscape.org. The venue cannot cater for you if you have not provided diet information.